Strong Foundations: Recap and recommendations from scientists regarding the federal environmental and regulatory reviews identifies 8 priorities and 7 gaps that the government must address to ensure that environmental assessment has a solid foundation of science. Canada’s environmental assessment system has been criticized by thousands of scientists in the past, including E4D, for ignoring science and basing decisions on politics, not evidence. The Government of Canada is now the process of modernizing this broken system, and has requested public input on their Environmental and Regulatory Reviews Discussion Paper. Evidence for Democracy participated in an initiative that brought together a cross-sector collaboration of 25 scholars and practitioners of environmental science, law, and policy from Canadian academic, government, non-government, and private sectors. 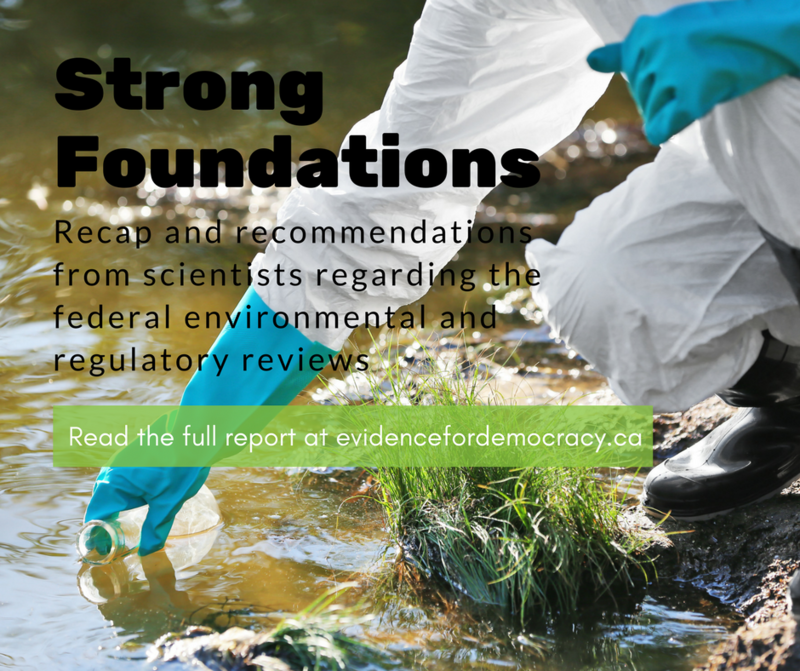 Our report, Strong Foundations: Recap and recommendations from scientists regarding the federal environmental and regulatory reviews identifies 8 priorities and 7 gaps that the government must address to ensure that environmental assessment has a solid foundation of science. We also offer a companion paper of recommendations specific to the Fisheries Act. By strengthening the evidence collected in environmental assessment, how it is used and shared, and how decisions are made, the government can begin to regain public trust and support a process that protects our communities, health, and environment. Read the executive summary and see the infographics.